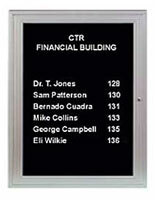 A letter board, such as a message board or bulletin board displays information to the public. 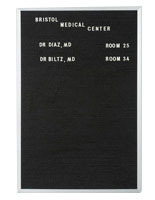 With its letter panel, precision grooves, inserting as well as changing letters is easy. 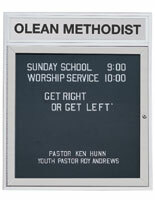 Our enclosed frame letter board is seen in all kinds of places such as churches, schools, hospitals, or businesses. 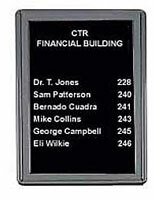 This letter board, also known as a bulletin board or message board is frequently used in lobbies, entrances, and hallways as well. 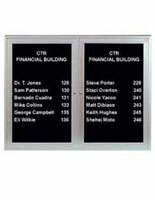 This letter board comes with hinged doors that come with locks so your message does not get tampered with. 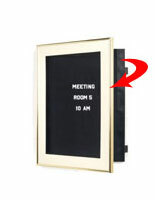 Also, its shatter resistant acrylic panes will keep your message from being disturbed as well. Interior case depth is 7/8" with the overall measurements being 24" x 36". 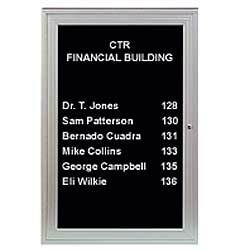 The letter board includes (327) 3/4" Gothic letters, numbers, and characters. 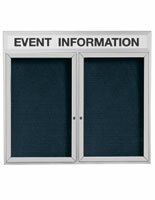 Four corner mounting holes are located on the rear of the display for the mounting hardware of your choice (hardware not included). 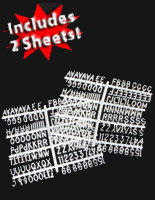 This unit is designed for indoor use only.